An empanada is a small, stuffed pastry that is either baked (al horno) or fried (frito). The name comes from the verb empanar, meaning to wrap or coat in bread. 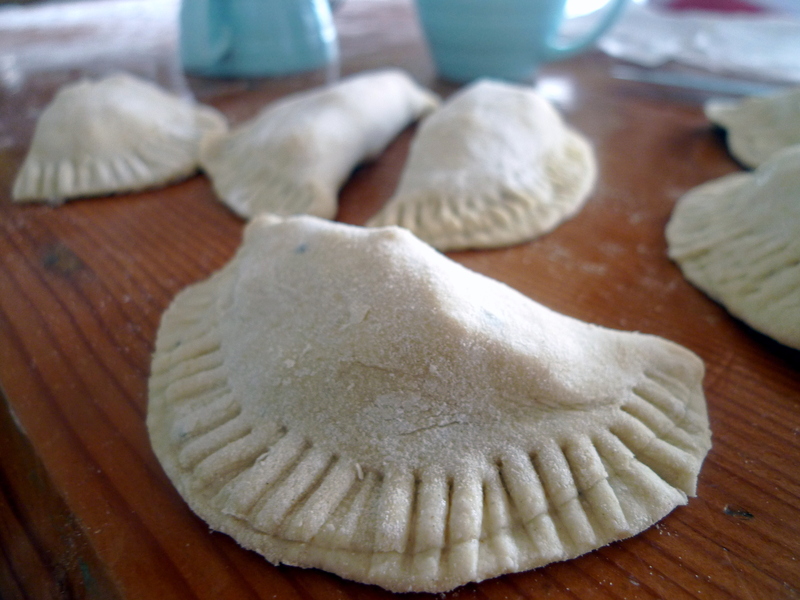 Empanadas derive their origins from Galicia, Spain and Portugal from way back in medieval Iberia times. Today, these savory little morsels are ubiquitous in Latin America, Southern Europe, and Southeast Asia. The pastry shell is typically made of flour, egg, oil, and some kind of liquid (water, broth or milk). The stuffing can consist of a variety of meats, cheese, vegetables or fruits, and will vary greatly by region. When Natalya and I traveled through South America, we were introduced to many regional varieties of empanadas. 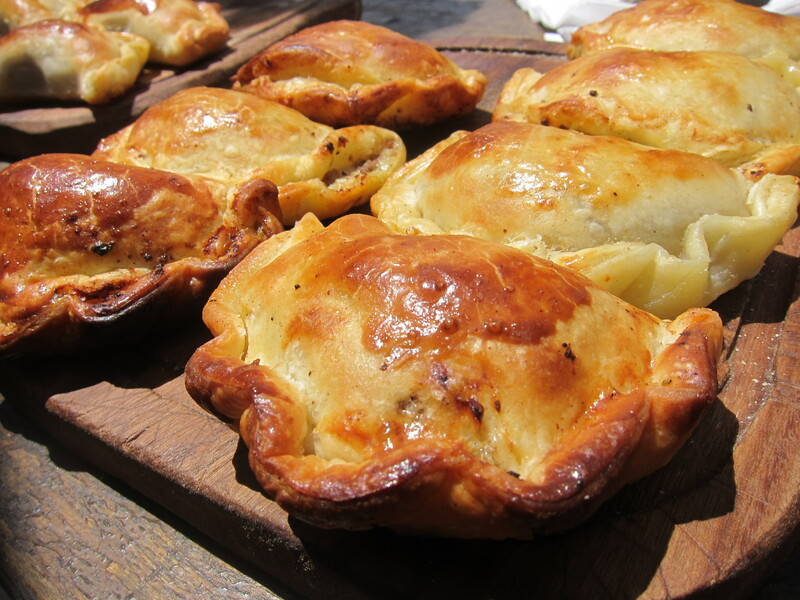 In Argentina, most of the empanadas we had were baked in a clay oven with a rich beef, onion and cheese filling (pictured below). 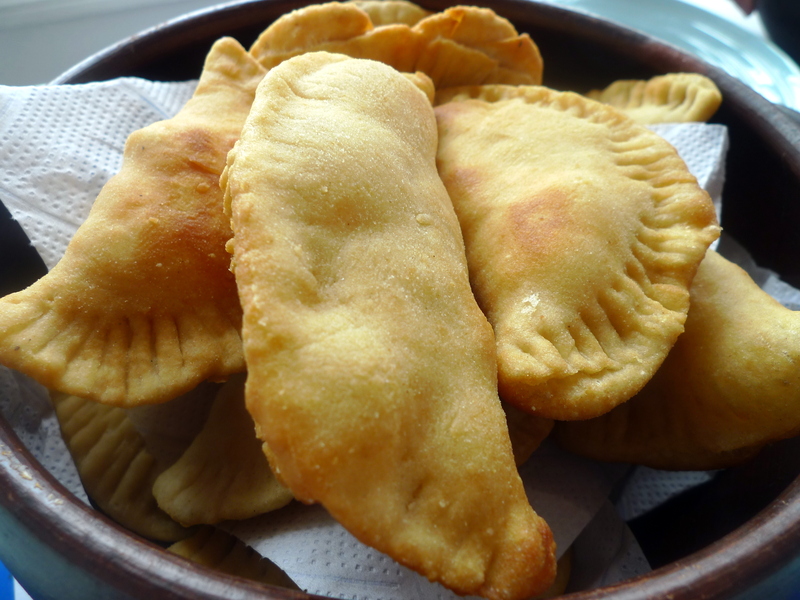 In Chile, we made fried cheese empanadas during our Chilean Cuisine Cooking Class. We also used the leftover pino (beef, onion, olive, raisin, and hard-boiled eggs) from the Pastel de Choclo (Chilean Corn Pie) to make additional empanadas. These are amazingly rich and hearty snacks that are simple to make and quite cost effective. They can also store well in the freezer once cooked, cooled and securely wrapped. My favorite part of these snacks is how versatile the fillings can be and I look forward to testing out more varieties! meltable cheese: queso chanco, mozzarella, muenster, Swiss and Havarti, etc. Pour flour into a mound on a work surface. Form a crater in the center and pour the yolk, the salt, the olive and the milk and then knead the dough until it is cool, soft and elastic. Wrap in a clean towel to keep it warm or wrap in plastic wrap to refrigerate for up to 6 hours. You can also freeze the dough if you want to keep it longer than 24 hours. On a lightly floured surface, roll the dough out to form a rectangle 18 x 3 inches wide. Use a coffee mug to cut circles out of the dough and roll out the circles until very thin. Add the cheese or beef filling to the center of the dough circle. With your finger, put a little of milk on the outer frame as this will help the dough edges stick together better. Carefully fold over the circle in half length wise into a semicircle, matching the wet edges. Use a fork to press around each mound of filling to close the dough securely. 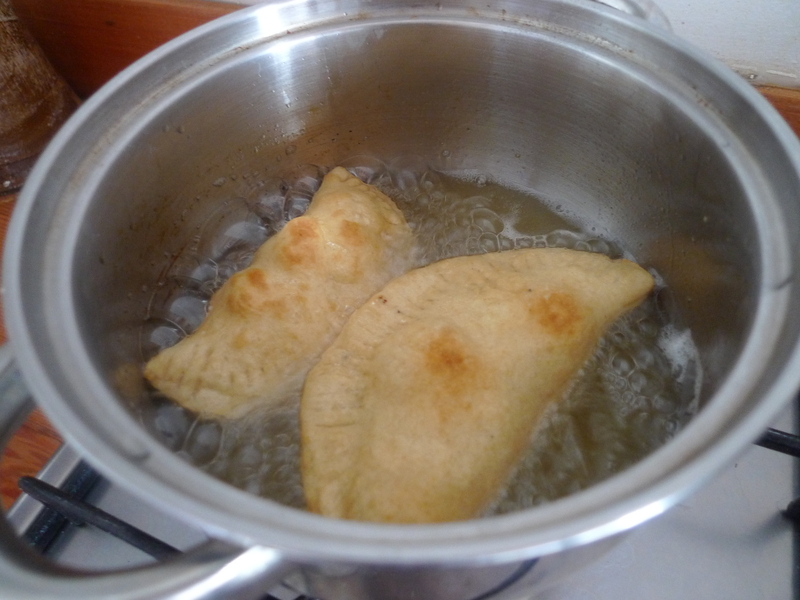 Heat the oil in a large pot and when very hot, carefully add the empanadas, a few time. When they are golden brown (about 2-3 minutes), remove them and drain on paper towels. As an alternative to frying, these may then be baked in a preheated oven to 400ºF. Beat an egg in a small bowl and brush the top of each empanada with the egg wash to ensure they have a shiny, golden shell when baked. Bake for about 12-15 minutes until golden brown.